Land records prove parentage - again! I can almost remember the day when I thought land records weren't all that important. I'm so glad that was decades ago and is a distant memory. And with what I discovered today, it reinforces the fact that land records must never be overlooked in our genealogical research. This 1778 deed, in which Jeremiah Brown and two of his sons sold land to Simeon Potter, was crucial in proving that Jeremiah was my Nathan Brown's father. 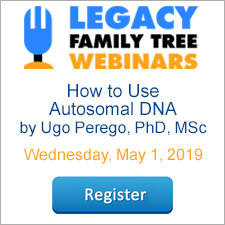 Marian Pierre-Louis discovered and explained its use in this webinar. We did not know it then, but this very same deed, just today, solidified the theory that this Jeremiah Brown's father was Esek Brown. Yet nowhere in the deed did it mention Esek. Today I located a 1759 deed where a Jeremiah Brown was given land by his father, Esek Brown. "I Esek Brown of Swansey...to my son Jeremiah Brown...."
Was this my Jeremiah Brown? If so, then I've now confirmed that his father is Esek Brown. But this could easily be a different Jeremiah Brown. Comparing the 1759 deed with the 1778 deed answers the question. I first thought to plot the land boundaries and comparing their shapes, but my DeedMapper 4.2 software hadn't yet arrived in the mailbox. So, I created a table in Microsoft Word to compare the key details of each deed. Remarkably, although the deeds were written about twenty years apart, they both describe the same land. The land Jeremiah was selling in 1778 was the same land that he was given - by his father Esek - in 1759.
Who was my Jeremiah's father? Esek Brown - the land records prove this. By the way...the mail just arrived. Guess what was in it? My DeedMapper 4.2 software. Today just keeps getting better and better. To learn more about land records, visit www.FamilyTreeWebinars.com/land. Everyone's talking about Legacy 9's brand new FindAGrave.com tools. I've got to admit, I love and use it too! I did a quick demo of how I use it in yesterday's after-webinar party. If you missed it, I've created a QuickVideo of it below. Enjoy! For more Legacy QuickVideos, click here. The recording of today's webinar, "Finding and Using Land Ownership Maps" by Rick Sayre, CG, CGL, FUGA is now available to view at www.FamilyTreeWebinars.com for free for a limited time. Land ownership maps in the United States are generally focused on the county level. Produced largely in the nineteenth-century in single sheet or atlas format, they were sold by subscription and also developed to commemorate events such as the centennial of the American Revolution. Though advances in printing such as lithography increased availability, maps were still expensive. Consequently, they likely will be found in more affluent areas. Property owners can also be found on military maps and other government published maps. Land ownership and residence can often be determined by correlating city directories with fire insurance maps. If you could not make it to the live event or just want to watch it again, the 1 hour 46 minute recording of "Finding and Using Land Ownership Maps" PLUS the after-webinar party is now available to view in our webinar library for free for a limited time. Or watch it at your convenience with an annual or monthly webinar membership. We would like to give thanks to all of you for making the release of Legacy 9 the most successful software release we've ever had - way more successful than we ever anticipated! It's been a week since the big announcement, and Legacy is still flying off the virtual shelves. Thank you! All free upgrade order emails have been sent. If you qualified for the free upgrade (purchased Legacy 8 from November 25, 2016 forward), and you have not yet received the email with the redemption instructions, the first place to check is in your email program's spam/junk folder. The majority of the customers we have communicated with eventually found the email there. If you have not yet done it, please add CustomerService@LegacyFamilyTree.com and LegacyCustomerService@LegacyFamilyTree.com to your email program's approved list. We will begin shipping any shippable products (printed user's guide, CD) beginning the week of May 8. In the meantime, we invite you to install and unlock your Legacy 9 purchase using the instructions in your order confirmation email. Yep, you can begin using it right now. Some of you have found a couple of "buglets" and have kindly reported them to us. We have corrected most of these and have issued a new update to Legacy 9. This update is free to those who have already installed Legacy 9. Click here for the latest update. Legacy Family Tree 9 - Unlocked! The most popular book we've ever sold (and it might just be the most popular genealogy book ever!) 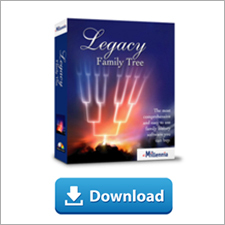 is the new Legacy Family Tree 9 - Unlocked! The entire book is based on Legacy 9 and helps you apply your genealogy research to Legacy. Click here for more information or to purchase. The PDF edition comes free when you purchase the printed book. Now that you've had a chance to kick Legacy 9's virtual tires, please join us for a free webinar on Friday, May 5. You'll get a tour of all of Legacy 9's new features as well as insider's tips and tricks. Click here to register. Legacy QuickGuidesTM have quickly become one of the more popular resources for genealogists. Each guide contains four (sometimes five, sometimes more) pages of valuable information covering a variety of genealogy research topics, dozens of clickable links, and are written by genealogists and family historians who are experts in the subject areas. We've added another new Legacy QuickGuide: Scrap Paper and Orphan Documents in Archives by Melissa Barker. Now choose from 86 Legacy QuickGuides! Genealogists collect mounds of documents about their family history. Many times, these genealogical documents are handed down or inherited from other family members. Among these mounds of documents could be scrap paper with information that doesn’t make sense to you right now, but might in the future. There could also be documents tucked in those boxes that don’t seem to belong to anything else; these are referred to as orphan documents. As genealogists, keeping these scrap pieces of paper and orphan documents is important because we never know when they will help us tear down a brick wall or help with other genealogical mysteries. So, they are filed for the future when they will come into focus for us and our genealogy research. Archives and archivists also have scrap paper and orphan documents. They too understand that these records will one day help a researcher and they are important to keep and archive. Genealogists should be looking for these scrap pieces of paper and orphan documents in archives. The recording of today's webinar, "Neighborhood Reconstruction: Effective Use of Land Records" by Mary Hill, AG, is now available to view at www.FamilyTreeWebinars.com for free for a limited time. Use USGS topographic maps, tract maps, plat maps, surveys, deeds, census records, and tax lists to reconstruct the neighborhood where your ancestor lived. Plat your ancestor’s land records and discover what unexpected clues might be discovered in the process. If you could not make it to the live event or just want to watch it again, the 1 hour 56 minute recording of "Neighborhood Reconstruction: Effective Use of Land Records" PLUS the after-webinar party is now available to view in our webinar library for free for a limited time. Or watch it at your convenience with an annual or monthly webinar membership.